Posted in Misc and tagged data breach, Helen Dixon, INM, tech conference at 12:13 pm on April 5, 2018 by Bodger. 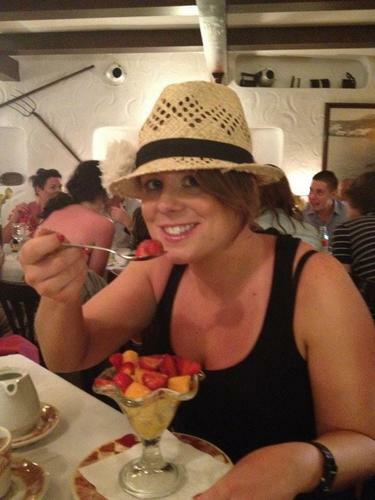 Gemma busy trolling again. There is no conflict. If anything its even more important for Helen Dixon to speak at that conference to drive home the obligations of businesses to respect their employees. 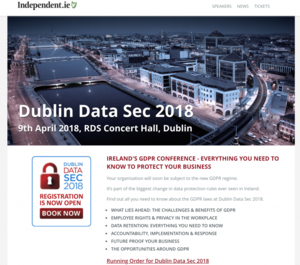 The idea that the Data Protection Commissioner is somehow compromised because the sponsor of a conference is under investigation is laughable. 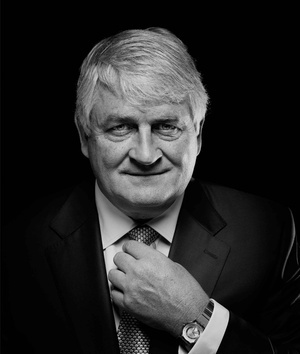 Data commissioner investigating INM is invited as a keynote speaker.to INM run event. Absoulutely no possibility of anything wrong. Clearly there’s a conflict of interest.. welcome to oireland. You’re going to have to spell out for me how the Data Protection Commissioner is compromised here. There is no exchanges of money, benefits or favours. She benefits from this in no way except being given a platform for her views, which is no bad thing given the recent news. She’s not a doctor on a freebee trip courtesy of a dodgy pharmaceutical company. She is meant to be investigating them while speaking at their event. Anywhere else this would be completely out of the question, not here though. But you know this, shills like you think your attempts to obfuscate these issues will work, they won’t. I’m a shill?! Thanks for the personal abuse. Its a useful distraction from actually identifying what the conflict of interest is in any meaningful way. If civil servants and politicians never spoke at a meeting just because the audience or organiser was subject to their powers, they’d never talk to anyone at all. Simply making a speech at a function doesn’t constitute a conflict of interest in any sense of the phrase. Stephan Rae, the editor of the Independent was controversially added to a so called fake news study group/panel in Europe. Stephen Rae sacked Gemma O Doherty for doing her job. Stephen Rae could be seen as using the INM association with Data Protection commissioner (Inm are sponsoring the conference and invited the guest speaker) as leverage to fight off the current campaign in Europe to have him removed from Fake news group mentioned earlier. She is also compromised by a conflict of interest since INM are responsible for the largest breach of data in States history. It is totally inappropriate for her to speak. Is there anything else I can help you with today Joe? No ,sorry, no conflict of interest as per SIPO rules. Vague associations, insinuations and “could be seen”” doesn’t amount to an actual conflict under SIPO guidelines. Helen Dixon is a smart person and may decide to pull out herself but there is no actual conflict of interest. If you think there is then you don’t quite know what a conflict of interest is. I’ve repeated myself in a few posts now so I’ll leave it there. I appreciate the patronising sign off at the end of your post though. Part and parcel of the role, Frilly. Data Protection Commissioner has attended most, if not all, IT security conferences I’ve been at for well over a decade. And with GDPR looming and affecting every single business big or small in the country, an official attendence by the DPC at a conference like this, whoever is sponsoring it, is important right now. The who’s sponsoring is a bit of an elephant in the room though. They need to not be sponsoring it asap. Give it up Gemma. The Terenure rugby abuse allegations were bad enough. But this is just nonsense, if not jealousy. Weckler just regurgitates press releases. What’s needed is a on line data base where at the push of the button free of charge you can trace where your data is going and if its been sold on . And if you object you can stop it. A law must be passed to ensure peoples data cannot be sent on to others without the person agreeing to who exactly gets the persons data. You clearly do not want to see the conflict here and are attempting to downplay the problem. As I said. A shill. Still need the hanky or maybe some pampers too? Mark Little, ex Storyful, who sold his very sam outfit Storyful to Rupert Murdoch is also speaking. #Levinson. Why not ask *him about that? Leveson? Otherwise the director of Diner will be getting very nervous. ‘Pecker in the popcorn’ and all. By the way, how is Broadsheet implementing the GDPR? I feel quite fine posting on here. Mind you, my real name is actually Armin Tamzarian. previous inquiry into the issue, where it appears that they did not get too concerned, and since the emergence of the matter in the four courts and the media, they are getting a bit more interested. be able to sort out fact from fiction where Independent Newspapers are concerned. I think we are just tired of no accountability in Ireland. Ms Dixon seems a fine young lady . I wish INM were not sponsors though. Akin to a Chief Supt giving a talk on home security when several of the attendees are under investigation for burglaries. Maybe she will use this appearance to speak directly about INM. BTW, this looks like an invitee-only do. No plebs allowed. At E350 a ticket INM are on to a nice little earner here. If Ms Dixon has to testify in court at some point in relation to this investigation how will it look after doing this gig. I would have though that professionalism would come first and that stepping down is a no-brainer. 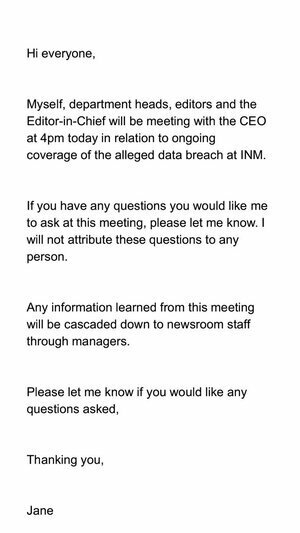 It’s also laughable INM just happened to be running a gig on Data Security right now. 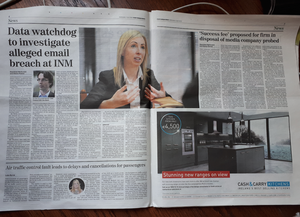 I don’t read any of the INM rags thankfully so let them at it and it’s also good for people to see how low and despicable Mr Denis O’ Brien really is. He truly is toxic and it would be great if he fupped off to Malta for good and did his pillaging somewhere else. We have a nation that’s mired in corruption and it’s partly because of reprehensible characters like him.